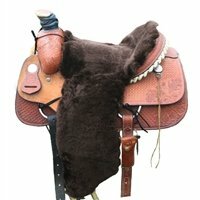 This complete saddle cover for the Western or Endurance saddle covers the seat all the way down to the stirrup. Makes riding more comfortable in summer and winter! Three hook and loop Velcro fender straps and grommeted ties guarantee a secure fit without removing the stirrup for attachment. Made from1" thick 100% Australian Merino Wool. Black, Brown, or natural colors.